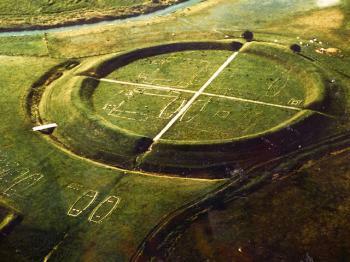 Viking Age Ring Fortresses is part of the Tentative list of Denmark in order to qualify for inclusion in the World Heritage List. I visited this tWHS in July 2016 on the way from Jelling to Roskilde. I was very lucky to visit when the largest Vikings festival of Scandinavia was taking place. Viking sites are not the most iconic sites on the list and usually it is quite hard to appreciate the few remains without any context. Usually I'm not to keen on visiting sites when there is a local feast or festival taking place but on this occasion I really enjoyed it. There were several tents next to the remains of the Trelleborg fortress. These were made out of animal hides and all those taking part during the 4 day festival lived in conditions which most probably were simalar to those of their ancestors. Children played with all sorts of traditional games with leather or wooden toys or simply played bare foot in the mud close to the mounds. Finding this atmosphere at about 8am in the morning instead of another empty viking site really helped to appreciate the site proper. There is a small museum with one of the most important remains - the Trelleborg viking shield - as well as a reconstructed longhouse. The latter was built in 1942 as a model of the longhouses inside the Trelleborg fortress. Although the reconstruction is not an accurate rendering it still serves its purpose of shedding some light on the exterior and interior elements of a longhouse. The Trelleborg longhouses were almost identical - 30 metres long featuring vaulted walls made of thick planks with large uprights supporting the roof and a fireplace in the middle of the building. The longhouses are likely to have been painted and decorated with fine wooden carvings. Similar to the Jelling mounds, the positions of the uprights and walls of the longhouses are now marked by concrete. Inside the circular ramparts surrounded by a sort of moat, the living quarters were laid out in four blocks, each containing four longhouses in a symmetrical defensive pattern. All of the ring fortresses were constructed around 980 AD according to the same design principles of strict geometrical architecture and a symmetrical layout. The drone photos in the museum (picture) help to easily identify this layout. I'd be surprised if such an important site in Denmark and Scandinavia were not to be inscribed on the list in the near future, at least as part of a transnational WHS.